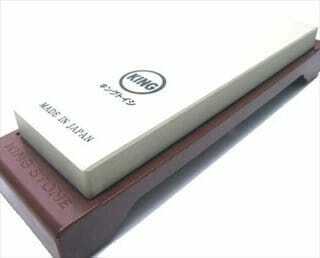 Another good quality Japanese Knife sharpening whetstone from King. This is a set at very affordable price too. This King HT-43/s-45 whetstone has a high grit at #6000 making it ideal for honing a mirror like edge to your Japanese style knives. Like all King sharpening stones, this comes shipped from Japan, so you know you are getting the genuine article. The 6000 grit stone sits within a plastic base, so there is minimal slippage during use. 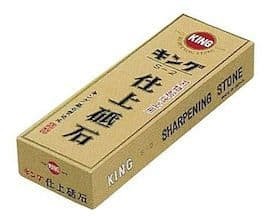 As we state, honing is the best use for this particular King whetstone, (they have a complete range of lower grit sharpening stones (240/1000) that are definitely worth checking out if you need something more aggressive). Some users have complained that the whetstone is a little on the small side. Measuring in at 7 x 2-1/8 wicth x 1/2 in Height, the dimensions are smaller than other Japanese whetstones available, however the size of this should tool not necessarily put you off. Unless you require a larger stone for wider plane knives, this one will look after your tools nicely. If you are reading this review in the first place, you are probably aware of how to sharpen a knife using a whetstone. (If not head to our knife sharpening guide here). The stone is ready to use after just 15 minutes soaking making it very convenient to use, (others will state that a whetstone should be left to soak overnight, however we realize and clearly so do King, that this is not always possible in the home kitchen and the demands of the normal user). 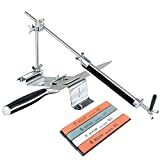 After only short use, any one that has some experience with a whetstone should be able to sharpen their Japanese knives with ease using the King 6000. As we have stated, with it being a high grit 6000 you should really work your knives with a lower grit first and then use this tool for that razor sharp, gleaming finish. Overall another affordable, good quality synthetic whetstone from King. Like other synthetic stones in this price range, it does leaves a dull-looking finish that happens to be surprisingly refined when run fully wet. Ideal for creating that razor sharp finish to your Japanese knives. Just make sure that you spend the money on also having appropriate lower grits stones in the collection. Only with the proper sharpening tools used prior to the 6000, will you get the results you want. 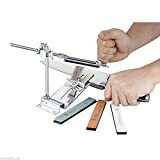 There are currently no videos of the King 6000 on Youtube, however the combination 1000/6000 grit stone sharpener from King does make an appearance. (see below). Head here for reviews and prices of the combination tool.